The first thing to know is that there are two major choices when you buy a new laptop: Windows laptops and Macs. Google now offers Chrome books as well, but these have yet to take off properly. Macs tend to be the more expensive option, but this is not always the case. If you are thinking about buying a Windows laptop from a major manufacturer like Sony laptops or Dell, the price can still be quite high. There is also a difference in the operating system. Macs run on OS X, whereas all others run on Windows. Both are easy to get the hang of, but you should try to spend some time using each of them to decide which his favorite when making a decision. Whether you opt for a Windows laptop or a Mac, one issue to consider is the size of the hard drive, which determines the amount of space you will have for storage. Hard drives tend to start at around 250GB these days, but they can be a lot bigger. However, remember that you can always purchase separate hard drives if you need more space in the future. RAM stands for Random Access Memory, and it essentially affects the speeds that your laptop will perform actions such as booting up and opening software. RAM tends to start at around 2GB these days, but it can be much higher. Essentially, the more RAM your laptop has, the better. However, remember that you can usually upgrade the amount of RAM at a later date if you want to. The amount of time you will able to use your laptop without a power supply is a big issue for many users. Many people buy a laptop in order to use it on the go, and if the battery only lasts a couple of hours this can be very frustrating. Try to find a laptop that offers upwards of five or six hours on the battery alone. Also, find out whether you can replace the battery yourself when it dies. For example, with newer Mac Books you have to get this done professionally. Screen sizes for laptops start at about 11 inches and usually go up to 17 inches. If you are using your laptop as your main computer, a larger screen is always best. However, you may want to choose a smaller screen for increased portability. One option is to choose a smaller laptop, and then to purchase a large monitor. You can then connect your laptop to this monitor and still enjoy the increased portability of a smaller laptop. 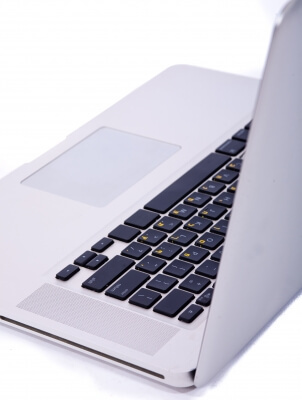 There are many issues to consider when you are purchasing a new laptop. The above guide provides you with a good overview of the main areas, but to make the best decision make sure you read up on some online reviews first to get a better idea about which laptop is right for you. Simon Green writes widely on computers, laptops and tablets, including all the latest reviews on the biggest brands including Sony laptops, Apple laptops and more.